We're an owner-managed small company and a team of experts with a passion for our region of the world. The exceptional quality of service that defines ATJ is a direct reflection of the knowledgeable, experienced, committed people who work here. 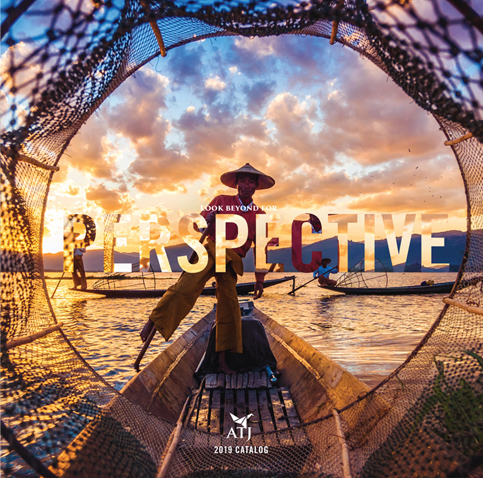 Along with our Asia travel experts, we believe that travel propels us outside of ourselves, beyond our previous understandings, to embrace new ways of imagining, new ways of seeing. Contact them when you are ready to Journey Beyond the Ordinary™. It was Marilyn's boundless enthusiasm for Asia that brought ATJ to life three decades ago. With degrees in environmental biology and sociology, Marilyn set off on to travel the world, landing in Thailand where the dream of starting a tour operator first took shape. After 28 years at the helm, Marilyn stepped down to pursue her own travel dreams. To ensure ATJ would remain steady on its course, Marilyn passed the company to three long-time employees, Donna Galland (CFO), Eric Kareus (Director of Travel) and Kirsten Louy-Nasty (CEO). Kirsten grew up in our nation's capital, dreaming of places far and away. After landed in Papua New Guinea to participate in a grassroots organization studying women and small businesses, Kirsten was hooked on travel for good. Kirsten created and received the first Cultural Studies Bachelor of Arts at Keene State College in New Hampshire and has gone on to travel extensively throughout four continents. Donna displayed a knack for numbers early on, which was honed with a B.S Degree in Accounting from CU – Boulder. She crunched digits for Moguls Mountain Travel as Controller and at a Boulder law firm as Financial Manager before seizing the accounting reigns at ATJ. She has her brown belt in Thai kickboxing, so keep your hands out of the till. Eric's knowledge of Asia borders on the encyclopedic—he has twice been named a Condé Nast Traveler Top Travel Specialist. He holds a degree from the University of Colorado in International Relations and Economics with an emphasis on the developing world. He was a guide in Europe, then joined ATJ in 1993 and has since traveled extensively throughout the region. Eric was raised in the arid Colorado River valley and reared on National Geographic, periodic family trips to Central America, and Asian cuisine. Simone's varied travel career began in the late 70's enabling her to live and work on several continents, eventually settling in the Rocky Mountains. A chance phone call, 24 years ago, led her to join the ATJ team. She finds it hard to choose a favorite destination and says it is the unscripted, magical moments and warm-hearted people that make travel in Asia so special. Exploration for Max began on the hill behind his house, building forts and climbing trees. He has since traveled to places as far afield as Laos and Mongolia, as well as to less coveted destinations closer to home, working in lumberyards and kitchens. Books were Max's preferred mode of discovery while earning his degrees in English Literature and History from the University of Colorado. But now, as part of the ATJ team, Max fuels his desire to learn by delving into the wealth of knowledge and new horizons available to him. When he’s not at work, Max can be found skiing the nearby mountains or catching a flight to somewhere far way. He's also a casual climber, gamer, writer and moviegoer. Janene has been in the travel business for over 25 years. She's a Colorado native whose travels have taken her to far-flung places throughout Europe, Central America, South America and Africa. Cherished memories include awakening at dawn in Botswana to find a wild elephant walking out of the jungle towards her. When not exploring she may be found cooking for friends and family and hiking around the Flatirons. A high school class trip to Europe unleashed Julie's adventurous spirit for the first time. After studying in Siena, Italy, backpacking through Eastern Europe and working in London, her wanderlust led her to Southeast Asia, New Zealand and Australia where she fell in love with the region. Having found her perfect career in travel, Julie has been with ATJ for over 10 years and counts India, Uzbekistan and China among her latest adventures. Despite her love of travel, Julie is also deeply connected to her southern roots and is a devoted Tar Heel from her days spent studying International Studies and Italian at the University of North Carolina, Chapel Hill. When Julie isn’t daydreaming of living abroad, she can be found hiking and skiing with her husband and two children in the Colorado mountains. A native of Croatia, Tamara is now a Boulderite through and through. After receiving an M.A. in Linguistics from the University of California at Davis, where she garnered multiple academic awards and scholarships, Tamara found herself drawn to the health and environmentally conscious culture of Boulder. In her off time, you can find Tamara practicing yoga and Pilates, biking around town, cooking up healthy meals, getting involved in community development projects and, of course, traveling. James’ wanderlust began at a young age crisscrossing North America in the backseat of his parents’ station wagon. A year-long collegiate study abroad experience in Spain opened his eyes to a world beyond what he had known and inspired him to seek out authentic cultural experiences around the globe. He has lived in Europe and South America and his adventures have taken him to twenty-eight countries on four continents. James holds honors degrees in Communication and Spanish from the University of Minnesota. Ginger grew up in Tennessee, Arkansas and Louisiana, fond of creole cuisine and the region’s rich cultural landscape. As newlyweds, she and her husband moved to Washington D.C. where Ginger’s sense of adventure was sated by visiting the city’s numerous museums and landmarks—at least until she and her family decided it was time to "go west" and moved to Colorado. Ginger brings to ATJ her many years of experience in the hospitality industry and an innate knack for making travel arrangements seem effortless. She’s eager to expand her knowledge of the cultures of Asia and the Pacific and to embrace the next adventure on the horizon. Heather was born under the shadow of a giant Paul Bunyan statue in Brainerd, Minnesota. Her early journeys took her to San Diego where she earned a B.S. in Finance and met her future husband in a class studying multi-variable calculus. Heather's recent forays into India and New Zealand have her looking forward to visiting more of the beautiful and exotic destinations frequented by ATJ. She is an avid runner, and recently completed two marathons, including the New York City Marathon. In winter you'll find her on a quest for champagne powder in the Colorado Rockies. Jan’s introduction to Asia began with a 4-month world trip with her brother visiting Thailand and India in 1983. Upon returning to the U.S., she attended the University of North Carolina in Chapel HIll, earning a graduate degree in library science. After a short stint at the University of New Mexico, she moved to Switzerland and worked at the Hauptbibliothek Universitaet Zurich-Irchel for over 12 years. During these years abroad, she travelled extensively throughout Asia – Indonesia, the Philippines, and most recently to Nepal, where she trekked to the Annapurna base camp. Currently she is happily settled in Boulder where she enjoys hiking with her daughter and commuting to work via bike. Cory grew up traveling throughout Central America, South America and Europe, volunteering and immersing herself in foreign languages and cultures. Her cultural curiosity inspired Cory to study Anthropology and Art History at The College of Wooster, Ohio and to study abroad in Rome, Italy. After a stint coordinating culinary vacations at a Chicago-based tour operator, Cory is excited to reconnect with her Colorado roots and to begin exploring Asia and the Pacific. When she’s not checking new destinations off her bucket list, Cory can be found indulging in culinary explorations in and out of her kitchen, hiking in Colorado foothills or enjoying a good book. Born and raised in Boulder, Colorado, Allie grew up exploring the mountains and dreaming of explorations further afield. This drive led her to study Asian Studies at The Evergreen State College in Washington. During a study abroad stint in Japan, she fell in love with the country and returned after graduating to teach English. She spent seven years teaching in Hokkaido, will always be her second home, and traveling around Japan and other parts of Asia, including South Korea, Vietnam, Thailand and Cambodia. Allie is now eager to share her love of travel and Asia with others. An island girl from Hawaii, Shannon decided to venture beyond the comfort of her own shores to experience mountain life in Boulder, Colorado. Her interest in communication that expands across national borderlines led her to pursue a degree in Geography from the University of Colorado University in Boulder. The endless running trails and active community of Colorado has captivated her as she has settled into her new home. She continues to follow her athletic pursuits alongside her work at ATJ and looks forward to running the trails of Asia one of these days. Warren is originally from Louisville, Kentucky, but considers himself more of a global citizen. After college, Warren spent 22 years in the Air Force, assigned to numerous locations around the world including the Australian outback. He considered the relocations as paid vacations and took full advantage of the opportunity to explore. He and his family finally settled in Erie, Colorado, due to its proximity to the mountains and beautiful scenery. He enjoys the outdoors and spends his free time hiking, biking, and traveling. He is excited to get back to Australia and add more of the Asia-Pacific region to his travel roster. Growing up in New Jersey, just half an hour outside New York City, I was raised in a melting pot of culture. Throughout my childhood, I spent many summers in Taiwan exploring its beautiful landscapes and expanding my palate. As I’ve grown older, I’ve had the immense pleasure of eating freshly baked bread on the streets of Paris as well as traversing the stone forests of Shilin in a downpour. My undergraduate career led me to study abroad in a remote area of Kenya, which enlightened me and taught me how to live closer to nature. Since graduating with a bachelor of science in Evolutionary Anthropology from Rutgers University, my travels have kept me within the states, and have allowed me to live in Boston, Queens, Las Vegas, Grand Junction and finally Boulder, where I am ready to sink my roots. While trips in my past have been influenced by my family, my future journeys will be driven by my stomach, as I am as adventurous an eater as I am a traveler. I am a firm believer that the best way to learn about a culture is to understand what they eat, how they eat, where they eat and with whom they eat. I look forward to getting back overseas and discovering tastes I’ve never-before tasted, with people I have yet to meet. Born to an Aruban mother and a Swedish father, travel has been a part of my fabric all my life. In my youth, we moved around a ton and my first memories are from our time living in Sweden. Travel has always excited and fascinated me, it's one of the few activities in the world that never loses its magical element. Through travel, people are able to empathize with other cultures, expand their knowledge base, and collect experiences that help define who they are and what they want from this world. While I traveled actively with my family in my younger days through Europe, North and South America, the Middle East, and even northern Africa, it wasn't until my study abroad experience in New Zealand and Fiji, when I really began to feel like a capable traveler. From there my interest has continually spiked and will undoubtedly do so for decades to come. In May 2018 I graduated with a Masters of Tourism Management degree from Colorado State University and have used that educational experience to guide me to ATJ and assisting others to fulfill their travel dreams. I am a Colorado native, I actually still live in the same little town (Frederick) that I grew up in. I am married to my high school sweetheart and we have two girls that keep us very busy. I enjoy spending time with family and friends, camping, hiking anything that gets us outdoors as well as taking road trips. We recently went on our first cruise and visited Jamaica, Grand Cayman and Cozumel, which was amazing! I can't wait to do again! I'm excited to travel more and experience other amazing places.